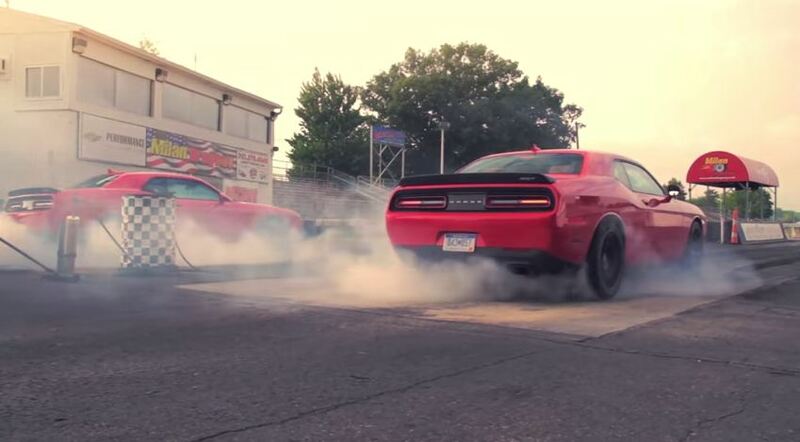 Check out some awesome 2015 Dodge Challenger SRT Hellcat burnouts in the video below. Gearheads have likely not stopped drooling since the 2015 Dodge Challenger SRT Hellcat was initially unveiled, and those puddles of drool only got deeper when Dodge announced that the Hellcat was good for 707 horsepower from its supercharged 6.2-liter V8 engine. We’re afraid the drooling isn’t over yet. (May as well just go out and buy some oversized bibs right now, huh?) Car and Driver just put out a glorious video on YouTube featuring twin Challenger SRT Hellcats showing off their stuff, while standing in place. Yup, that’s right: a burnout video. Check out the 2015 Dodge Challenger SRT Hellcat burnouts in the video below. We’re tellin’ ya—like music to the ears. Dealers are now able to order the 2015 Dodge Challenger SRT Hellcat.